After-work networking groups have become a huge part of today’s professional life in Uptown Charlotte. Happy hours, dinners, and specific industry networking events can be found daily in bars, restaurants, and meeting rooms around Charlotte every single day. 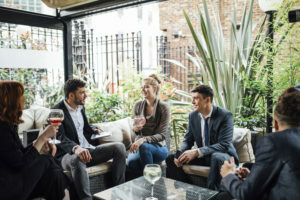 Have you been trying to extend your network of friends, colleagues, and associates through these events but find your accent to be a barrier to making meaningful connections? At Carolina Speech Services, we help professionals of all ages, all industries, from a variety of countries, with a wide-range of first languages improve American English pronunciation skills. While you may be fluent in the English language, your ability to articulate certain words might be a barrier for your American counterparts to understand everything you are saying. One of the common reasons our clients choose to engage in accent modification class is the ever-annoying occurrence of “What?” and because they want others to feel comfortable with them so they can grow strong business and personal relationships. It has been mentioned more than once that the invitations for networking and social gatherings just don’t come as often as they should and many feel their accent is a barrier to invites being extended. So while they may be willing to go to networking events available to them, they struggle to get next step invitations. If this sounds like you, you may consider accent reduction class to learn the skills to soften your accent as needed. After completion of our accent reduction program, you may enjoy increased confidence to attend more networking events, to introduce yourself to new people, and continue to grow those new relationships after the event. With clearer American pronunciation, your new acquaintances will not only understand you better, but they may feel more confident that you are understanding them clearly. There can be a misguided thought that because you don’t pronounce English clearly, you may not understand it clearly either. We want to help you avoid those misunderstandings too.